How to create a Gantt chart like sprint report with shapes in presentation? 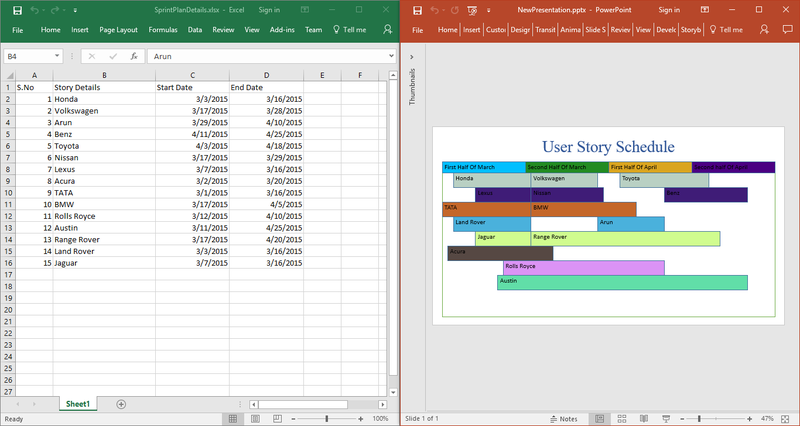 In PowerPoint presentation, you can create a Gantt chart like sprint report for the data in excel file or from database. The Essential Presentation and Essential XlsIO libraries can be used to achieve this. Divide the PowerPoint slide’s width by the number of sprints involved in the sprint report. Divide each sprint space with the number of days involved in the sprint. Now you can draw a rectangle shape for each task by calculating the bounds from its start and end dates. The above steps can produce the result as shown below. The below links demonstrates importing data from a database to an excel file using Essential XlsIO library.